I am a FAN GIRL of Petite Crown. And really of the owner Mari. That’s right. I said it. 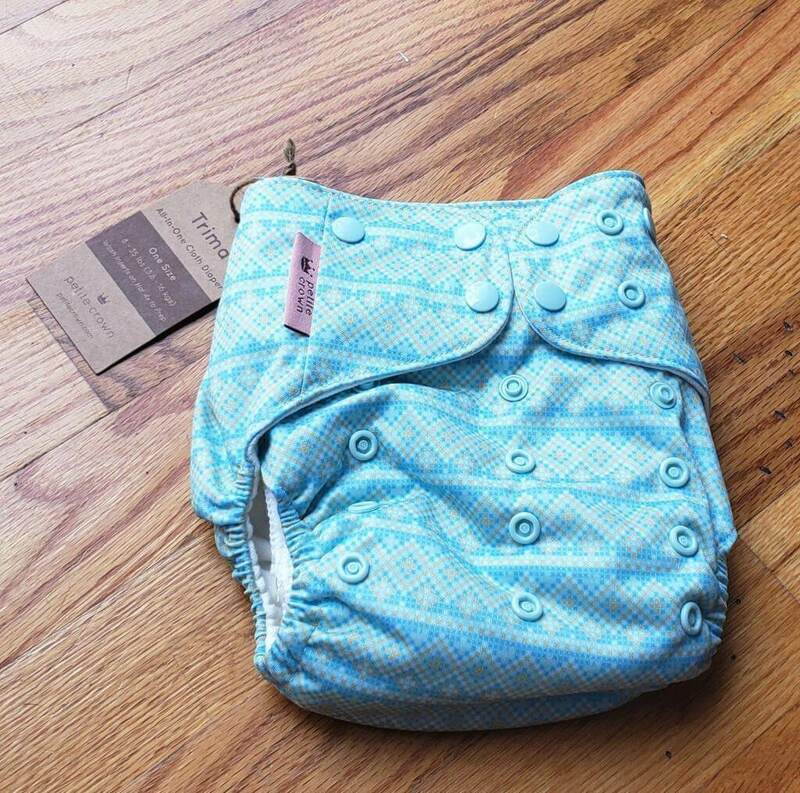 They are a new cloth diaper company, but they are doing ALL of it right! You are gonna want to keep reading so you can see why I love them so much. Of course I’m going to tell you how great the diapers are, but you know what really makes them shine? 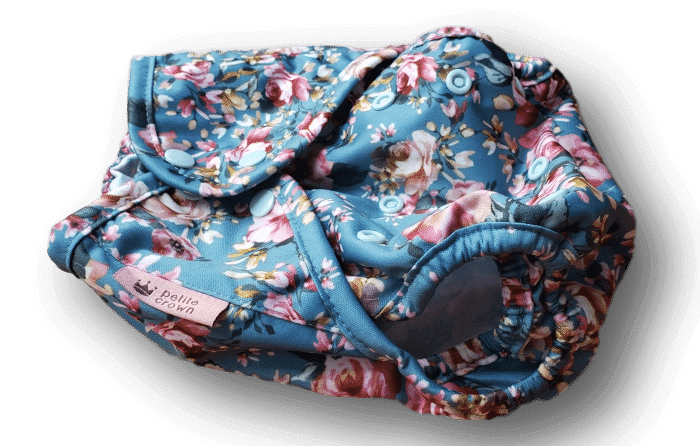 For every product purchased, Petite Crown donates a cloth diaper to a family in need. They have partnered with Jake’s Diapers for this amazing act of charity. Petite Crown truly believes no family should struggle for the necessities. 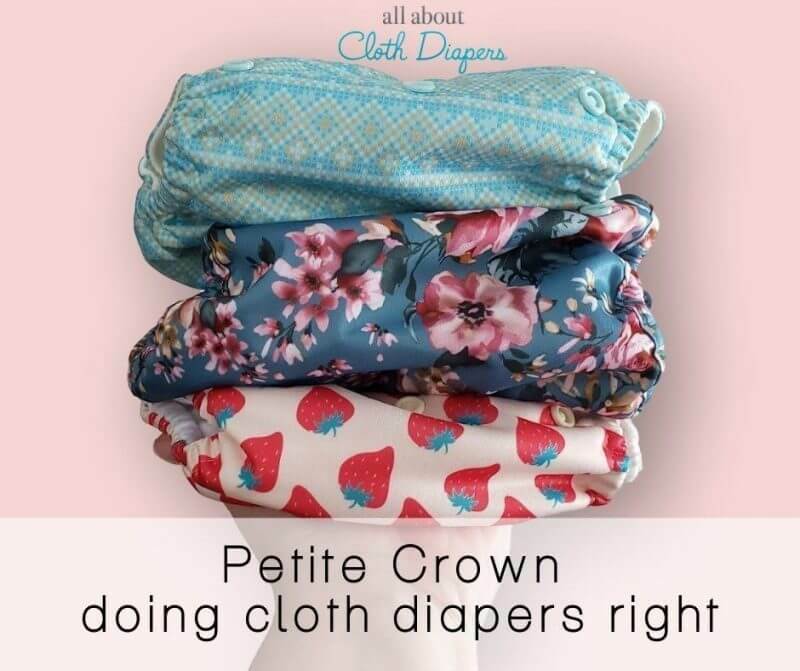 I do currently work with Petite Crown as they are a sponsor for All About Cloth Diapers. But everything I say here is honest and true. The Trima, which is an all in one, is labeled to fit from 8-35 lbs. Sizing is generous and I actually have a feeling that they could last a bit beyond that. My youngest, Norah, is now 2.5 and about 30 lbs. I think she was 38″ but I’m guessing on the height. She is on the last rise setting although I do go back and forth to one rise down. There are still has a few snaps left at the waist so there is plenty of room to grow. All of Petite Crown’s products are well made. Elastics are nice and stretchy but still have that quality feel to them as they bounce back into shape easily. The snaps give a satisfying pop when you close them. On the bum photo taken today. I hate when diapers looks ratty after just a few washes. It’s a sign of inferior quality materials being used. If a brand is using inferior materials, where else have they cut corners? These wash easy and the inserts dry fast. The Trima is an all in one, but is made of two snap on overlapping petal inserts. This my friends, is why it won’t take forever to dry like some all in ones. Each insert is 1 layer of bamboo cotton and 2 layers of hemp cotton. 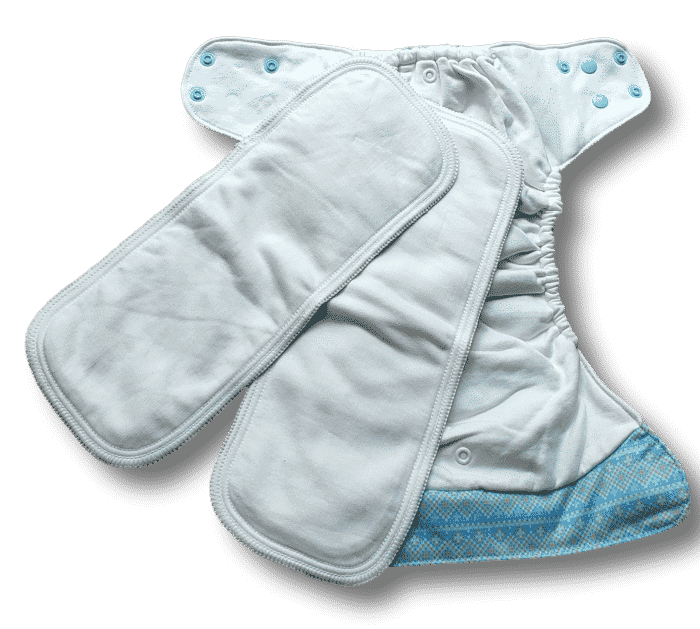 It is also lined with bamboo cotton which provides an additional layer of absorbency . This makes for 7 layers of absorbency in the diaper. It is also what would be considered a stuffable all in one. That means there’s a pocket behind the snap on inserts that you can use to stuff in extra absorbency if you need it. I tested the Trima as part of my absorbency tests. It got a respectable 13 oz. This is a great amount for even a heavy wetter during the day. If plan to use these for extended naps or even night, go ahead and utilize the stuffable pocket. Hemp boosters are always a nice choice as they are trim and absorbent. I’m just going to also quickly go over the Petite Crown Catcher cover. It is a one size cover with an adjustable snap rise and is labeled to fit 10-40 lbs. This has a pad folded flat inside. I’ve gotten these to cover most of my bulky overnight fitteds. So they are ROOMY. The reason I said some is that there isn’t quite enough rise for night fitteds that have a larger rise themselves. But it’s certainly worth a try with these, as it held up well for me and my kid is a super soaker at night and also on the taller side. The Catcher features double leg gussets. That means you can stuff a mattress in and not get leg gaps. This also means they are very easy for ANYONE to put on and get an easy, great fit. You can use any absorbency inside them (just no microfiber). And they are reusable. Just wipe the cover out between uses and keep using until it smells or gets poo-ed in. Petite Crown has been doing it all right. 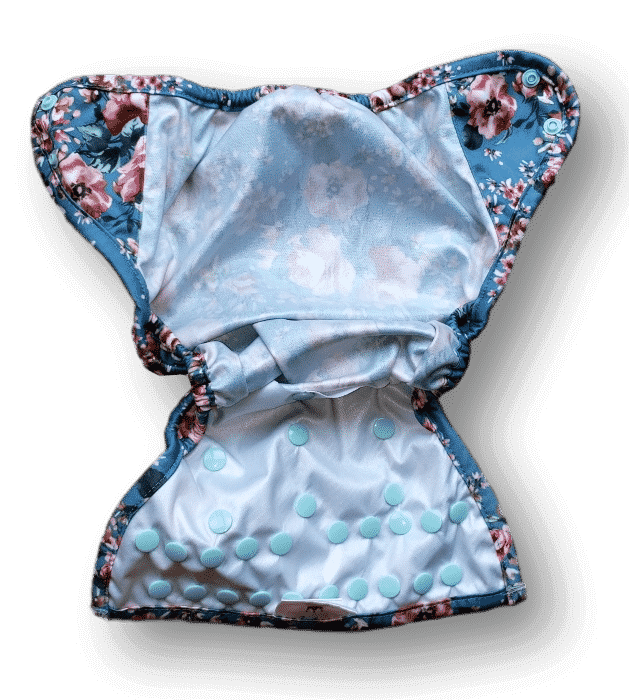 They have provided high quality, easy to use cloth diapers. They are treating their customers right. And they are giving back. Why not become a fan girl with me and give them a try? Make sure you follow them on Facebook as well because they share so many adorable fluff pics! If you have used Petite Crown, leave us a comment and tell everyone what you think! I love that she is a social good business. That and the Dino print was enough to make me a major fan! I always prefer a b1g1 (Buy 1 Give 1) model and she is the ONLY one who I have found thus far doing a full b1g1. It says a lot about who she is, what she holds in high esteem, and what type of company she is starting and that is someone I can get behind 110%. I want to try the trimas so bad! I didnt know that the Trima’s are part of my absorbency tests. It got a respectable 13 oz. My daughter is a heavy wetter and we are always looking for new diapers! ? I love their prints, I want the Trima so bad! I hope to be trying a petite crown diaper soon! Omg I love these, super cute and love that the Trima has 7 layers of absorbance. That is awesome for a heavy wetter like my daughter. 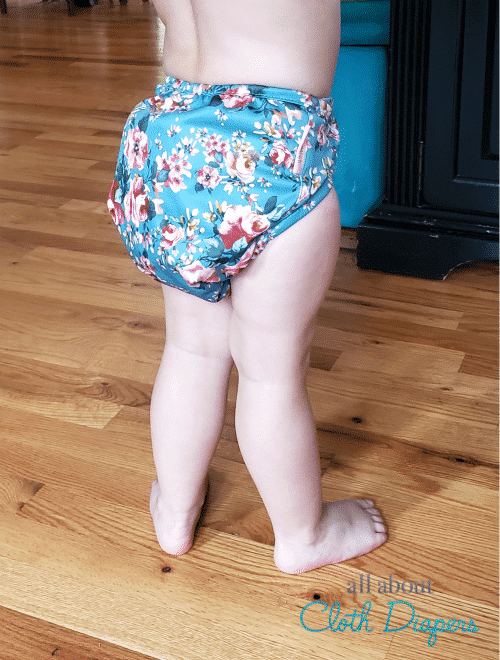 Just learning about these amazing diapers and would love to try. Things I’ve learned is sunning is an amazing trick, bamboo is a lifesaver and double gussettes really help hold it all in. I LOVE the Petite Crown Trimas! Why no mocrofiber? I just got some stay dry microfiber best bottom inserts. ? Wanting to try a trima so bad!